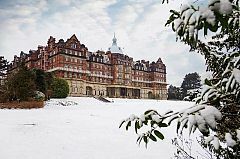 Set on the edge of the Yorkshire Dales, the prosperous spa town of Harrogate makes for the perfect place to enjoy all the fun of the festive season. Whether you’re a group, organisation or a company, our excellent choice of Christmas parties available in Harrogate will be sure to provide everyone with an extravagant night of celebration. If you’re a small group who doesn’t want to miss out on the thrills of a larger scale atmosphere, then our top range of shared Christmas events will be perfect for you. Alternatively, if you’re a large group that would like to afford some privacy and experience a night that’s just for your team then why not browse our exclusive events? There really will be something for everyone here; we handpick only the best venues and only work with the most dedicated suppliers. That means that you’ll be able to rely on each venue’s attentive events team who will help you book your perfect Christmas party night in Harrogate. From indulgent food options to sophisticated drinks and incredible entertainment, we really do have you covered this year! If you’re up for a bigger bash, and like the idea of mingling with other companies, our shared Christmas parties could be a winner for your team. You can benefit from high production values, fine quality food and drink and top-class décor, all at a price that comes in under budget. Open up your Christmas party to the possibilities of more fun, music and laughs, with an infectious atmosphere that comes from a larger event. You might even find that it turns into a good networking opportunity, although the emphasis is on having a good time and treating your staff to an end-of-year shindig. Take a look at our excellent choice of shared Christmas party nights below. With our exclusive Christmas party nights, you and your team will be able to relax and unwind in your very own party space that's exclusively for you; you’ll enjoy your own area, suite or if you’re a particularly large group, you may even be able to indulge with full venue hire! Many of our venues in Harrogate are flexible and offer many packages to make your night even more special! From VIP red carpet arrival, to delicious drink deals and fantastic rates on overnight accommodation, you really will be able to make it a night to remember! 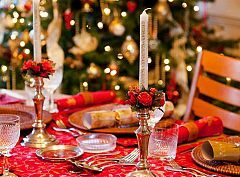 Get ready to sparkle with one of these fantastic events and celebrate your festive party in pure style! Decided what Christmas party night you like the look of in Harrogate? Perfect! The next step is to enquire for your chosen party online. Simply just complete the quick enquiry form and fill in all the vital information before submitting. Your enquiry will then be passed to your venue of choice, who will be in contact with you shortly. You’ll also receive an email from Eventa confirming receipt of your enquiry, along with a unique reference number for your records.